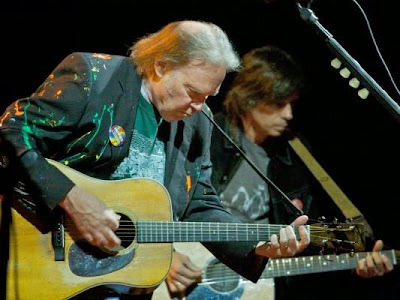 Neil Young News: Anthony Crawford on Neil Young: "He goes way deep. He's a cave." Anthony Crawford on Neil Young: "He goes way deep. He's a cave." 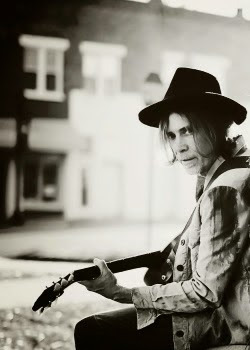 Anthony Crawford, a band mate of Neil Young, has played guitar, piano and sang on the previous tours. Songfacts: Let's talk about "San Andreas." You wrote it when you were working with Neil Young. You were at his home in Northern California and constantly living in fear of the earthquakes that were happening there. What was the writing process for that song? Anthony: Well, I can recall getting on the airplane to fly home after one of my trips out there. I was just looking out at the runway as I was leaving San Francisco airport and thinking about the place. I was just somehow comparing the fear that I had of an earthquake to the beauty that I was able to experience while being there. It was the yin and yang kind of thing - Okay, well, your biggest fear is here but you're experiencing one of the most beautiful places on the planet - as far as the way it affected me as a person. I'm not saying everybody would love it. But I just think that because of the contrast that it has and just the big wide open sky at night - where Neil Young lives is so magnificent. No wonder the guy writes the best songs, or at least at one time he did, living where he lives. About two or three miles over a hill and you're on the Pacific Coast. You then go the other way and you just have the most beautiful rolling California hills. You then can go in another direction and you're right in the middle of these sequoias, which are massive trees. It just had it all. It was just the most magical place to be was on his property, and, specifically, where I was sleeping. I would just get up and look at the stars. You could see a satellite go by. You just never knew what was up in that sky. The sky was just deeper than anywhere that I'd ever been. So somehow I was comparing the energy that I felt of like - Oh, God! If one of these trees fell on me, I'm dead! When I go out there, I still always know that looms. But so does a tornado down here in Alabama. Fear is fear. I think fear is crippling and I don't like to even dance with fear anymore. Fear, not sudden calamity, is my whole thing. But the song is basically praising that area. We kind of make a joke, "If God had a home, she'd be living there." When we sing that lyric, everybody always giggles because we reference God as a woman. But on the music aspect of it, I learned from Neil Young how to record - how to capture magic and how to identify magic in music, and how to work around the constant desire of the temptation to make your music perfect. It's what's wrong with music from these days right now to me is that people can make it perfect. They can line it up to a grid and fix anything that's out of space and time. I think the music takes a hit because of it. So I just learned how to record. As many times that I've been in on a session with Neil Young, and he's pretty much the mantel piece because he is a purest about recording. I was fortunate to grow up with him. My growth for my life of music – I met him when I was 23 years old and I'm 58. So off and on throughout all my years, I've been involved with him. But I learned a lot from Neil Young. I learned a lot from Steve Winwood. He is the best musician that I have ever known in my life. He can play anything and he's just such a fabulous person. He's a great human being. He's accessible. He's not a rock star 24 hours a day. Neil Young is, you can't approach him, but Steve Winwood is a friendly dog. Neil's got a sign that says, "Caution! Will bite!" Neil's got a very loving side to him, too. I just think that he's such a serious artist. He's deep. He is deep and dark. He goes way deep. He's a cave. Steve is a mountain. Full interview Anthony Crawford of Sugarcane Jane | SongFactsby Laura Antonelli. Also, check the new Sugarcane Jane album, Dirt Road's End, by visiting sugarcanejane.com or on iTunes. However, don’t expect a resumption of Crosby, Stills, Nash & Young. Crosby burned a bridge with Neil Young in an interview last year when he said something derogatory about Daryl Hannah, Young’s new romantic interest after leaving his wife of 30-some years. Young blasted back in an interview with Howard Stern, saying he loved Crosby like a brother but couldn’t work with him. CSNY was the most uninteresting part of Neil's career, so if he does not want to go back there, I have no problem with that. CSNY had their moment decades ago. I don't know that Neil's fans are longing for a reunion. Anyway, got tickets today to see Neil and Promise Of The Real in Milwaukee. Bring on the rebel content!